In the context of the debate on the future of the EU, which was triggered by the Brexit referendum and the rise of nationalism, it is crucial for the European public to understand who shapes the plans for reforming the EU and what the views of these influencers are. 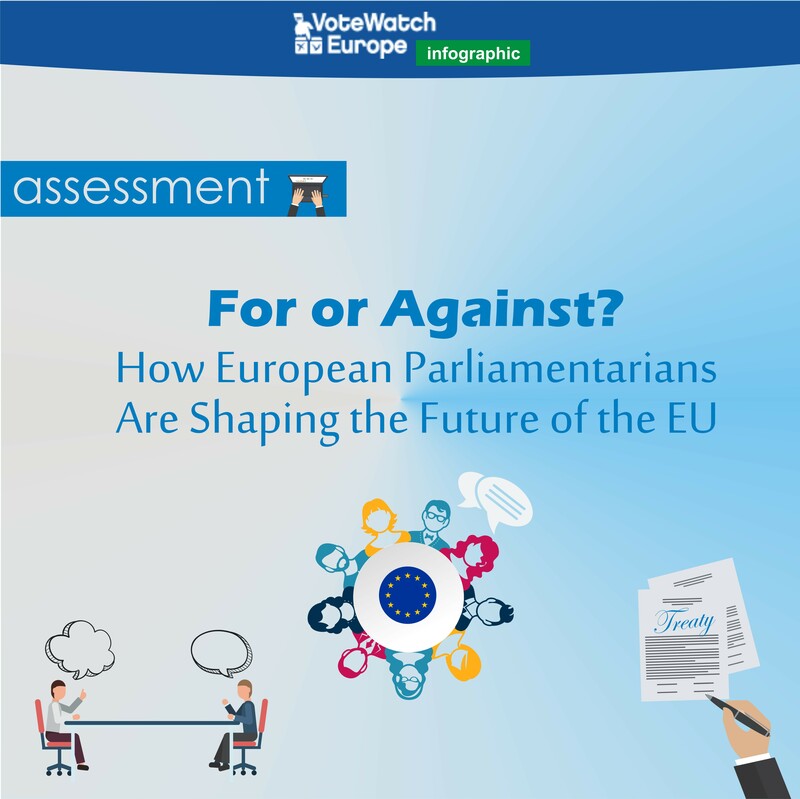 To this purpose, VoteWatch Europe looked into key parliamentary activities and the votes of the MEPs on a set of crucial decisions to assess who are the most influential MEPs on constitutional affairs and in which direction each MEP and political faction pulls. The algorithm we used to analyze the data has been developed with the help of more than 200 experts in EU affairs, who suggested criteria and weighed their importance. 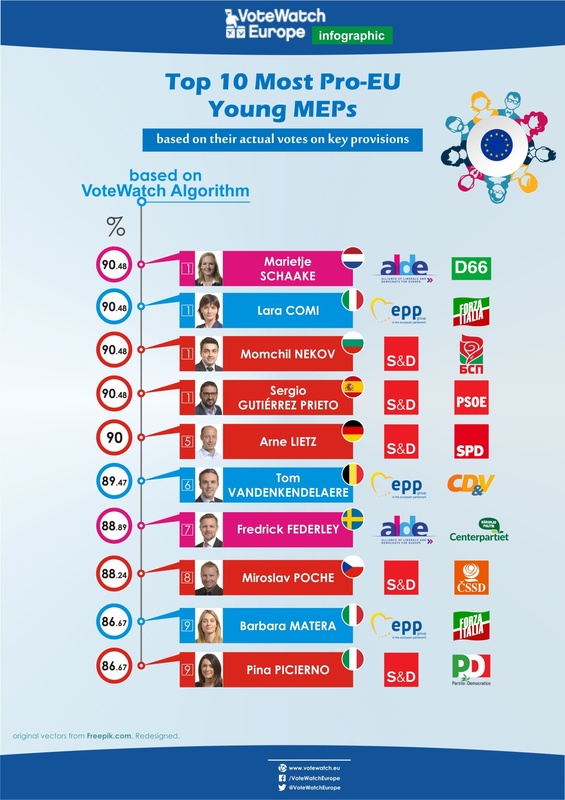 – The list of MEPs that stood out as the most influential on constitutional affairs is headed by German Social Democrat Jo Leinen (S&D), Belgian ALDE group leader Guy Verhofstadt and Polish MEP from the Civic Platform Danuta Maria Hubner (EPP). – The liberals of ALDE and the Social Democrats in S&D are, on average, the most favorable towards more EU integration, closely followed by the biggest parliamentary group, the EPP. The Greens are also in general supportive of EU integration, but reject some of the current initiatives. 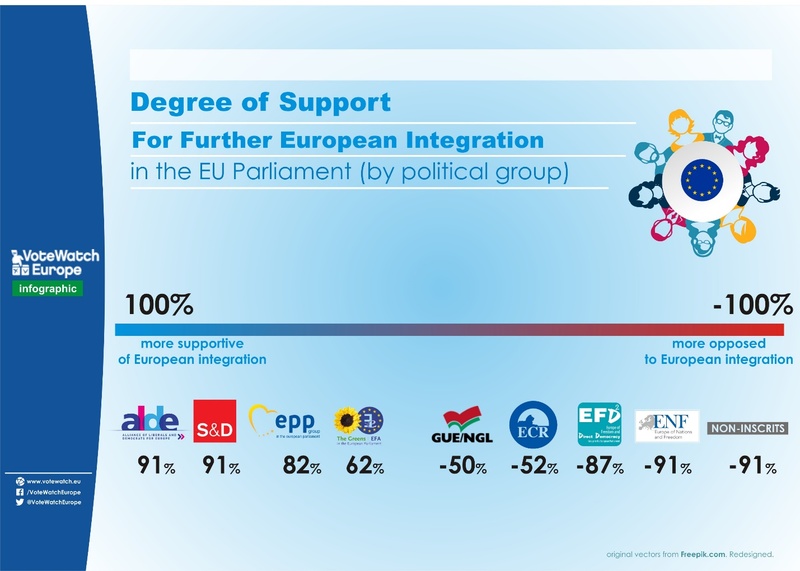 The far-left GUE-NGL and the conservative ECR groups oppose almost all initiatives that aim at deepening integration, while the Eurosceptic EFDD and ENF stand out as most nationalistic. – The Portuguese Socialist Party, the French Democratic Movement and the Dutch D66 are, overall, the most supportive of further EU integration. The Italian Northern League, the Greek Golden Dawn, the UK Independence Party and the French National Front are the most Eurosceptic parties. – The post-communist South Eastern Europe (Slovenia, Croatia, Bulgaria and Romania) are most favorable to a European federation, while Northern Europe and Greece provide lower support. 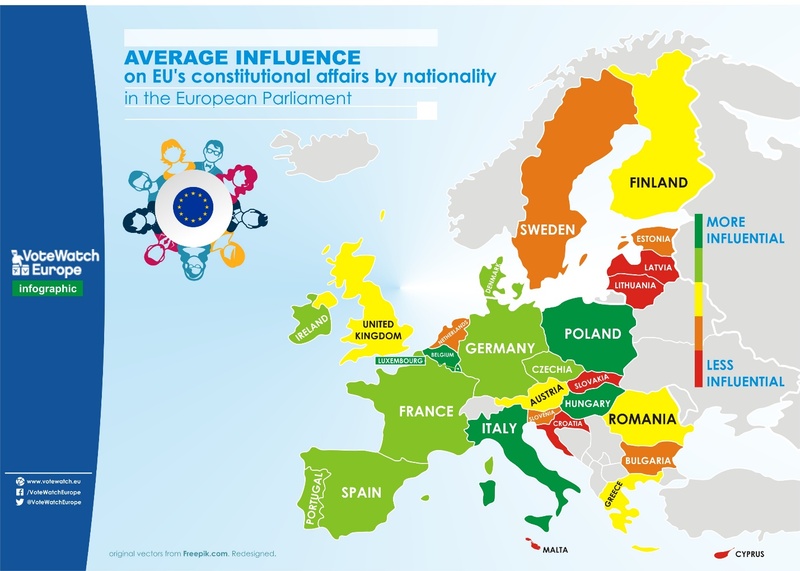 – However, in terms of actual influence, South Eastern European countries tend to be less influential than Central and Western European countries (when it comes to decision-making on EU’s constitutional plans). – MEPs who are younger than 40 years old exert only little influence when it comes to shaping the future institutional setting of the European Union, as the decision-making in this area is clearly dominated by more senior politicians. More than half a century after European countries decided to come together in the best interest of all, Robert Schuman’s dream seems to be taking a turn for the worse. Brexit, the rise of nationalism across the continent, and voices more critical to the Union than ever before are raising questions about the future of the EU as we know it. Change is slow and difficult to grasp, until reality hits you in the face with the popular vote. Luckily, change does not always have to come as a surprise. If you know where to look, you can spot trends before they emerge and irreversibly influence the political landscape. And, when it comes to European politics, where better to look than the European institutions? The European Parliament in particular is the place where the future of the EU is debated. 751 representatives coming from over 200 political parties are there to voice the views of the European people. While views come in all shapes and sizes, there are two main currents of thought: supporters and detractors of the EU project. They say that you cannot manage what you cannot measure. So, we decided to measure the views of the Members of the European Parliament (MEPs) based on decisions, not merely opinions. 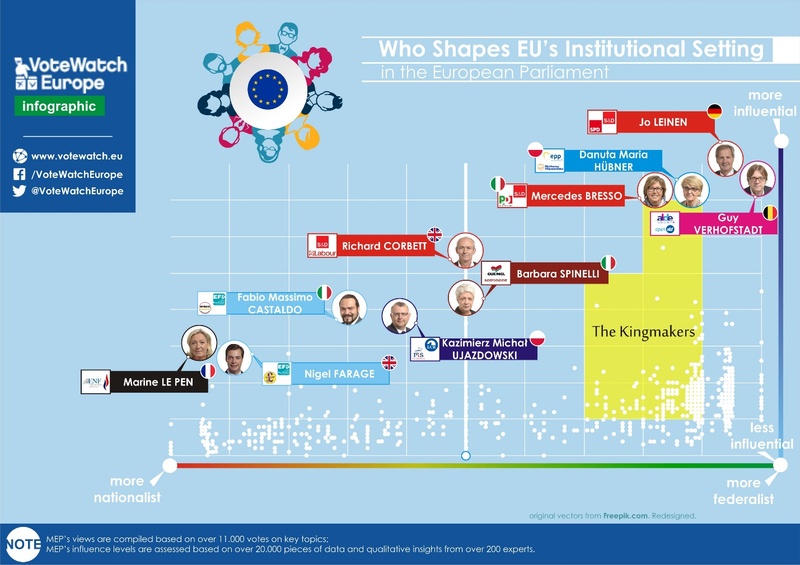 We also measured how influential each MEP is in shaping EU’s institutional setting. Through this research we aim at creating a more accurate picture of the state of the European Union and give everyone with an interest in influencing the future of Europe the necessary information to act. Who Is Influential and Why? To determine the views of European Parliamentarians, we selected 21 relevant decisions made during the current European Parliament term (two years and a half). 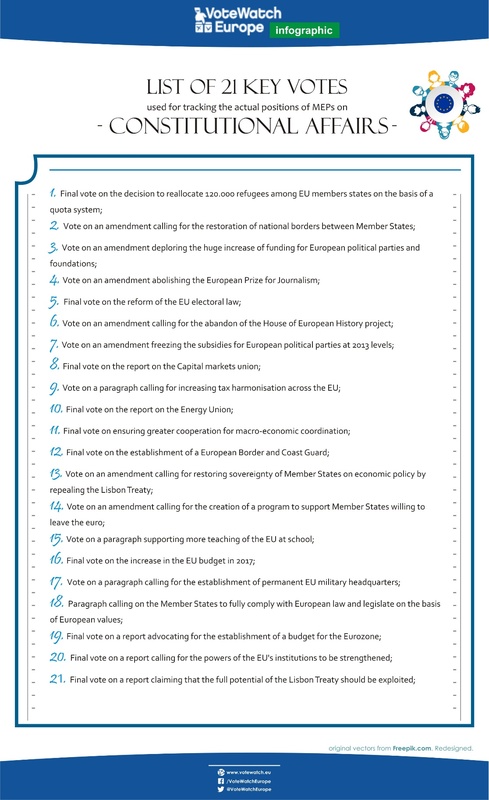 Decisions range from increasing the powers or the budget of the EU, to measures to enhance EU’s visibility in Member States (see full list of decisions in the annex). Additionally, we focused on the activities of the EP’s Committee on Constitutional Affairs, which deals with the rules on the functioning of the EU institutions and the relations between them. We also considered the roles played by MEPs in organizations such as the Spinelli Group, Union of European Federalists and the European Movement. Lastly, we factored in the positions held in the EP which impact on inter-institutional relations, such as the President and Vice-President of the European Parliament and the chairs of political groups. Marginally, we considered the indirect influence on EU debates that some political figures, such as Nigel Farage or Marine Le Pen, exert through actions at home, as opposed to pushing proposals in the European Parliament. The algorithm we used to analyze the data has been developed with the help of more than 200 experts in EU affairs, who suggested criteria and weighed their importance. We adapted it to fit the peculiarities of the policy area under scrutiny. Here are the results. 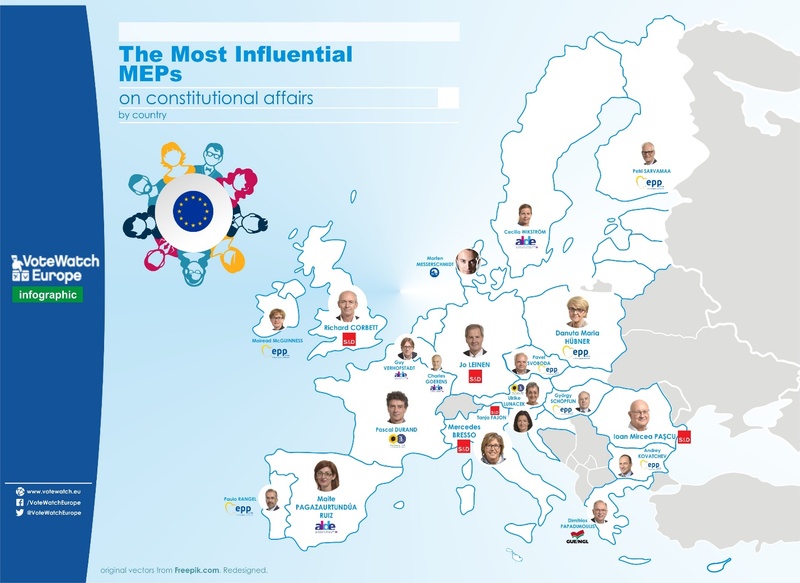 Ten European Parliamentarians stood out as the most influential on constitutional affairs. Most likely, many of them are the ones who will lead Europe in the coming years, either from the Parliament, the Commission, or as leaders of their own countries: the latest switch of Martin Schulz back to national politics to compete for the Chancellorship of the strongest EU country is the latest in a long list of MEPs who ended up leading their national parties. 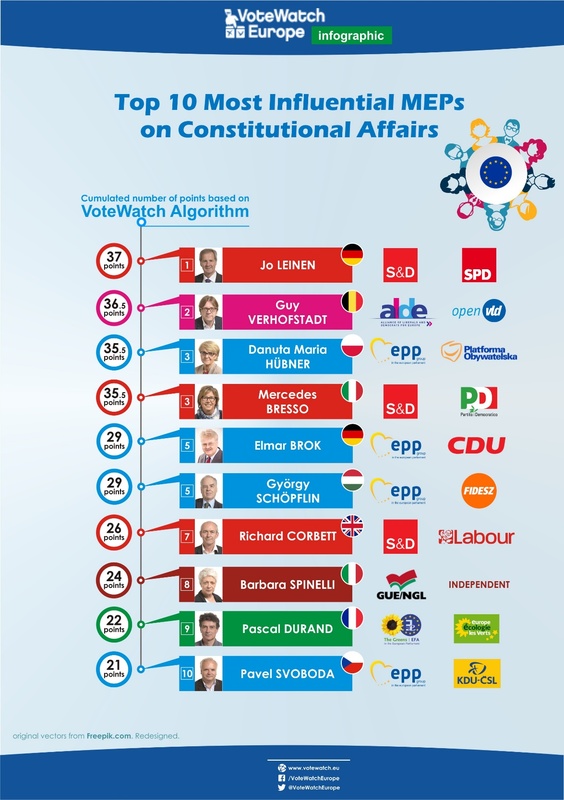 German Social Democrat Jo Leinen (S&D) is the most influential MEP on constitutional affairs. He is a senior member of the Committee on Constitutional Affairs, which he chaired from 2004 to 2009. During this term, he was co-rapporteur on the reform of the electoral law of the EU. He is also active in several federalist organizations and he is the President of European Movement International. Belgian ALDE group leader, Guy Verhofstadt, is an experienced politician who has been appointed as Brexit negotiator on behalf of the EP. He has drafted a report on the potential evolutions of the current institutional set up of the European Union. He is also a member of the steering committee of the Spinelli group. Polish MEP from the Civic Platform Danuta Maria Hubner (EPP) is the chair of the Committee on Constitutional Affairs and has been rapporteur on the reform of the electoral law and the interinstitutional agreements on better law-making, as well as on the European Union Crisis Reserve. Hubner is also a member of the steering committee of the Spinelli group. Tied with Hubner at the third place, Italian Democrat Mercedes Bresso (S&D) is the coordinator for S&D in the AFCO Committee and a member of the steering committee of the Spinelli group. She co-authored a report on how to improve the functioning of the European Union building on the potential of the Lisbon Treaty. German Christian Democrat Elmar Brok (EPP) is very active on constitutional files. He co-authored a report on how to improve the functioning of the EU building on the potential of the Lisbon Treaty. He is also the President of the Union of European Federalists. Tied with Elmar Brox at the fifth position, Hungarian MEP from Fidesz party György Schöpflin (EPP) is the political coordinator for the EPP in the AFCO Committee and a member of the Spinelli group. He drafted a report on the European Citizens’ Initiative and he is the shadow rapporteur for the EPP on a key report dealing with transparency, accountability and integrity in the EU institutions. A British Labour MEP, Richard Corbett (S&D), was the rapporteur on the revision of the Rules of Procedure of the European Parliament, as well as the co-rapporteur on the interpretation and implementation of the interinstitutional agreement on better law-making. Italian Barbara Spinelli, daughter of Altiero Spinelli, is an independent sitting in GUE-NGL. She is one of the vice-chairs of the AFCO Committee and the coordinator for GUE-NGL in the committee. She is often the shadow rapporteur for her group on constitutional files, such as the implementation of the Treaty provisions concerning national parliaments. French Green, Pascal Durand (Greens/EFA), is the political coordinator of his political group in the Committee on Constitutional Affairs and often shadow rapporteur of the group on the files drafted in the committee, such as the report on possible evolutions and adjustments of the current institutional set up of the European Union..
A Czech EPP’s MEP, Pavel Svoboda (Christian and Democratic Union – Czechoslovak People’s Party), was the rapporteur on the interpretation and implementation of the interinstitutional agreement on better law-making. He was also opinion rapporteur for the JURI Committee on other key constitutional files. 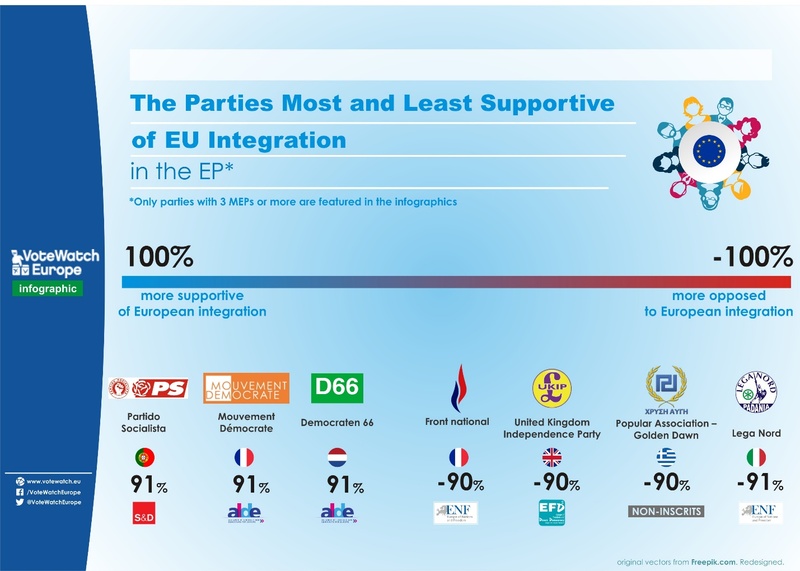 Among the transnational political groups in the European Parliament, the Liberals of ALDE and the Social Democrats in S&D are, on average, the most favorable to more EU integration. They are closely followed by the biggest political group in the EP, the European People’s Party. Apart from these three groups, only the Greens are supporting more EU integration, although they are more critical towards the way this is currently being put forward. The far-left GUE-NGL and the Conservative ECR oppose the current initiatives aiming at deepening EU integration, though for different reasons. The Conservatives are outright opposed to the idea of political integration, although they support internal market-related proposals. The far-left is more open to political integration, but they are critical of the current European framework, which they deem to be too neoliberal. Finally, the Eurosceptic EFDD and ENF are the most opposed to European integration and reject any initiative that goes in this direction. We also measured which national parties are the most committed to promoting further European integration, as well as which ones are the most Eurosceptic. Among the most pro-European, we found the Portuguese Socialist Party, the French Democratic Movement and the Dutch D66. In addition to these parties, also liberal parties from smaller countries (such as Luxembourg and Estonia) hold strong pro-EU views. Parties at the far-right end of the spectrum are the most opposed to an EU federation and are advocating for dismantling the current EU system of governance. The Italian Northern League, the Greek Golden Dawn, the UK’s Independence Party and the French National Front are the most Eurosceptic parties in the EP, per our assessment. Large support for a European federation comes from the post-communist South Eastern Europe (Slovenia, Croatia, Bulgaria and Romania). Understandably, these newer Member States have more enthusiasm for the European Union. Some have just begun to fully reap the economic benefits of being part of the Union and there are few reasons why they would want to take a step back. Lower support was spotted in Northern Europe as well as in the austerity stricken Greece in Southern Europe. Even so, the picture is not bleak: in every country, there is a positive average support for further European integration. Not surprisingly, except for the UK. Countries whose delegations rank high on the pro-European scale are not necessarily the most influential ones when it comes to decision-making. Here, South Eastern Europe tends to be less influential than Central and Western European countries such as Belgium, Luxembourg, Poland, and Hungary. Italy also rank among the most influential, although the Italian delegation is not the fondest of a more powerful European Union. 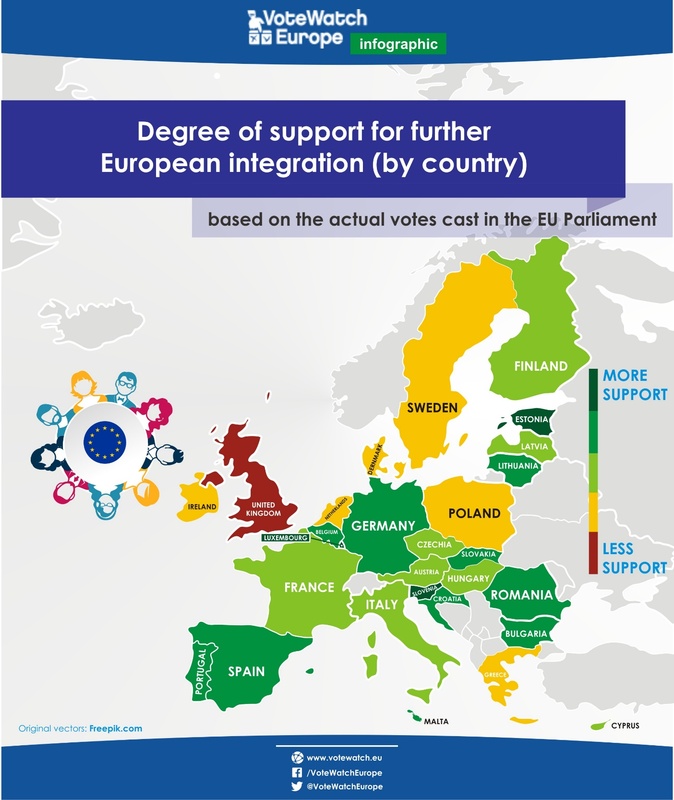 This discrepancy between support for further integration and actual influence in the European institutions might explain many of the mixed messages that the EU sends. The European Parliamentarians who are both strongly pro-European and influential on constitutional affairs are Jo Leinen, Guy Verhofstadt, Danuta Maria Hubner and Mercedes Bresso. At the other end of the spectrum, the champions of Euroscepticism are Marine Le Pen, Nigel Farage, Fabio Massimo Castaldo and Kazimierz Michal Ujazdowski. But who are the undecided? 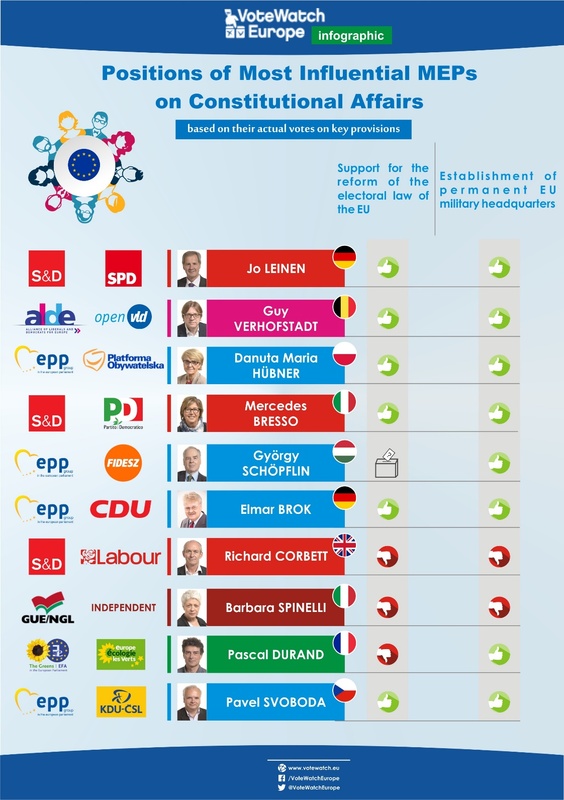 This infographic only scraps the surface of the European Parliamentarians who hold the reins of the future of Europe. As anyone familiar with electoral processes knows, there is hidden power in the groups who have not yet made their minds or can be convinced otherwise. If you’d like to get a full picture of who the most influential MEPs are and their positions, contact us at [email protected]. According to our assessment, MEPs younger than 40 years old are not very influential when it comes to shape the institutional setting of the European Union. However, over the next few years, some of these young policymakers will develop the experience and confidence needed to lead and reform the European Union. Our list shows which young MEPs are the most supportive of a stronger EU. Lastly, here is the map of the most influential MEPs on constitutional affairs from each member state. We all have a stake in the way the European Union will function in the future. Whether we can get past the obstacles and carry the European dream further or not, and under which conditions we go either way, greatly depends on the men and women who represent Member States in the European Parliament. Understanding their views and having a clear vision of who influences decisions and how is one of the most important steps in getting involved in the shaping of Europe. Who holds the switch on EU’s energy policy in the Parliament? Tints of Green: Who Influences Environmental Policy in the European Parliament and How? For mapping of EU Parliamentarians’ and governments’ actual positions (based on actions undertaken in the EU decision-making process, not mere statements), impact analysis of Brexit, national elections or other events on EU policies contact us at [email protected]. About us: VoteWatch Europe is the think tank most followed by the Members of the European Parliament, according to an independent study. Our reports are also quoted frequently by European and international institutions and the world-wide media.